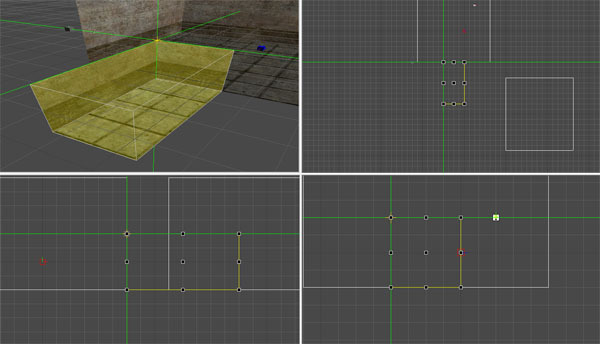 Note: The above left is often known as subtractive building, such as in NOLF2, CJ and TRON. The above right is the common method called CSG or Constructive Solid Geometry. 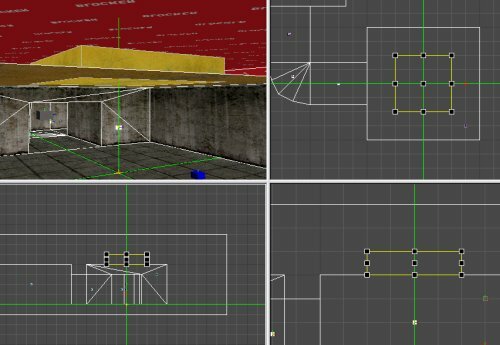 CSG is used in games like Half Life 1 and 2 and NOLF1. If you are interested in building the subractive way for NOLF 1. Then you need to do a few special things. 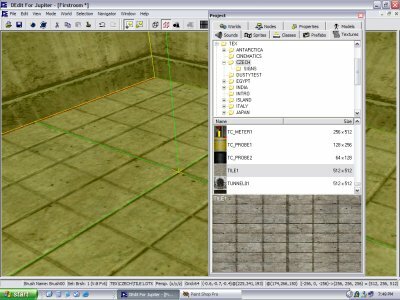 Check modmakers tutorial for information on -nosnapnocsg. Here's a top and side view of the same room. The room on the left has 36 faces. The room on the right only 6! If you build using the block method (like Legos™) then you are adding 6 times the geometry and textures for the game to process! 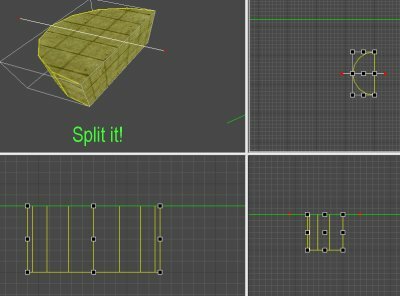 It's better to build with the single sided method. 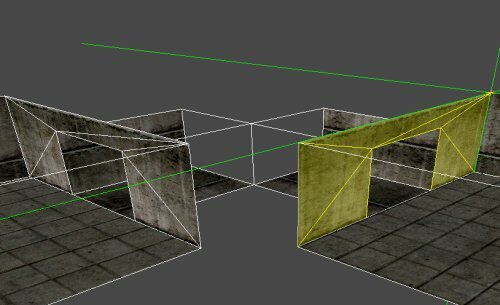 If the camera is on the backside of the polygon (wall) then you will be able to see through it. Now you can certainly build your level out of blocks, but don't come crying to me when the frame rate drops to 2 FPS when a few players start walking around. Captain, she can't go any faster! All-righty kiddies! Break out your mouse in your right hand and the spacebar in the left. 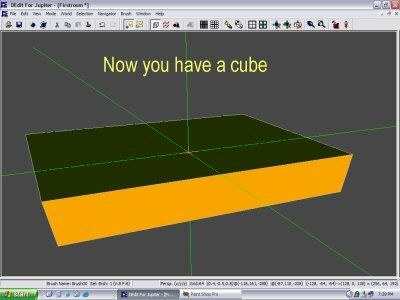 LETS MAKE A CUBE (YAY)! 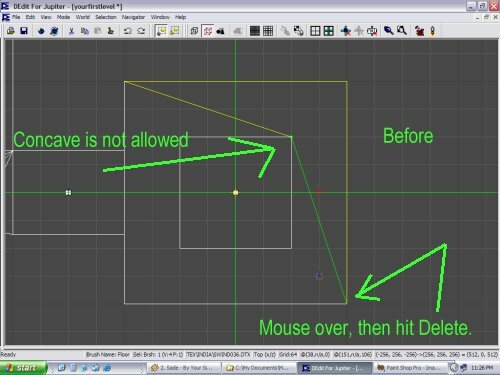 USE I and O and your Mouse to move around. I like it thick baby. Once Completing a shape (square) a window will pop up asking you how thick the brush is. 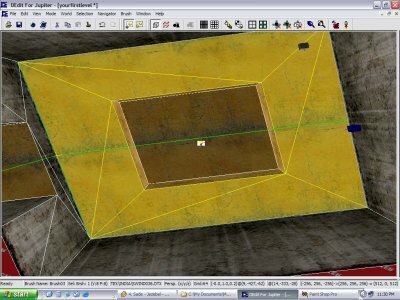 Depending on what window you started in, you may be specifying depth, height or width. The following paid advertisement is brought to you by the geometric shape 'Cube'. Actually it's a quadrilateral if you want to be specific. This ain't so hard is it? Toggle your project window so you have more space. I like to hide the project window. It's big, its bulky, its fat with the spoils of the land. 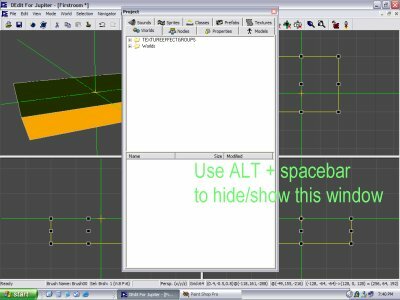 Press Alt + Spacebar to toggle it on and off once you've detached it from the side. 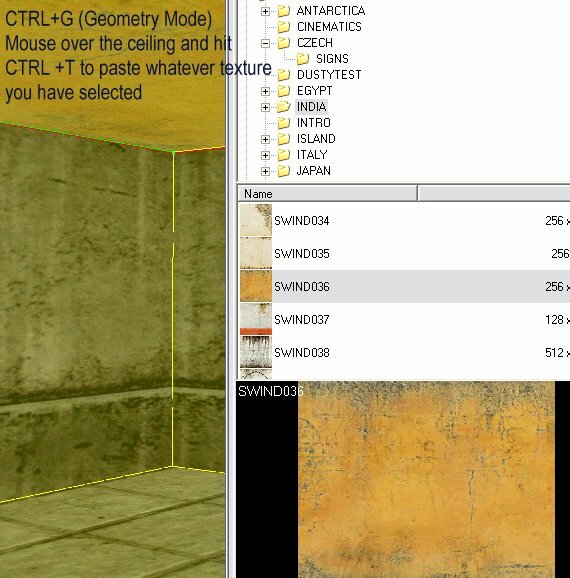 In the project window click on the texture tab. Select a level from the game. I think this one was in India folder. 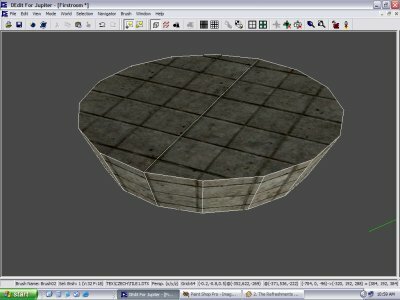 Once you have your texture selected, Hit CTRL + T to texture your cube. 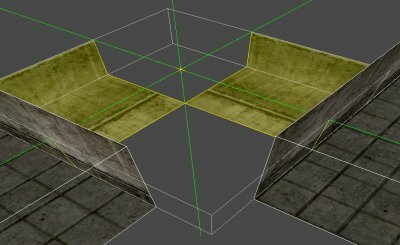 By golly a textured cube! Quick - tell mom. She was impressed wasn't she. This cube is going to be the walls of our first room! 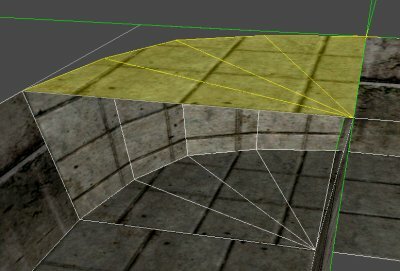 Hit F to (flip the normals) put the texture on the inside of the cube. 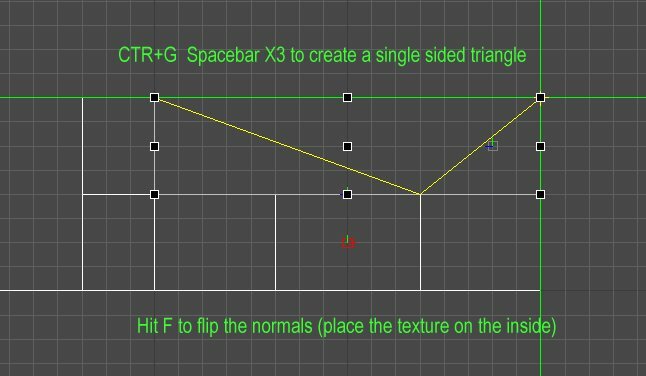 If you want to walk around saying "flip the normals" I definitely recommend it. Yo it's like a skeleton, but for shapes man! 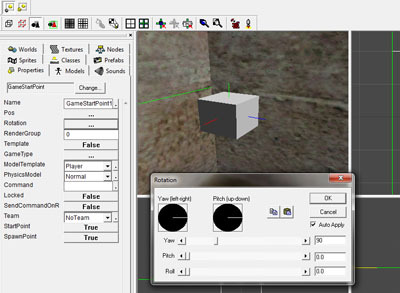 Right click in the 3d view and choose view options and select show wire frame. You don't have to but it makes seeing the brushes (walls etc) easier. Good Lord, I've created a room! Check out the fun textures on that hose-hound! Now we need to make our cube respectable sized. With the cube selected grab one of the handles LMB and drag. Make the cube 256 x 256 x 256. Notice the little coordinates in the lower right. 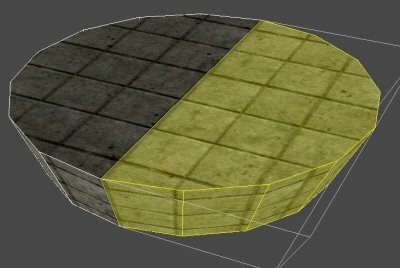 Find a savvy floor texture like these tiles and with your cube selected (click on it genius) go into geometry mode (ctrl+G) and mouse over the floor area. Now hit ctrl+T. 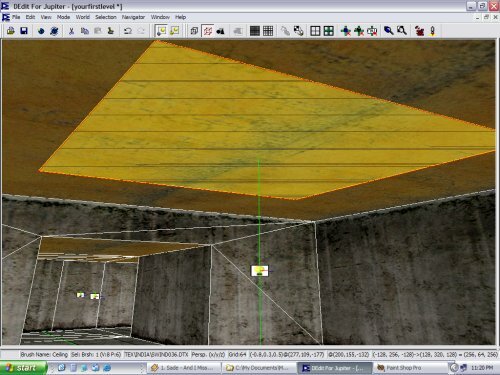 A nice ceiling texture is in order. Same thing for the ceiling. 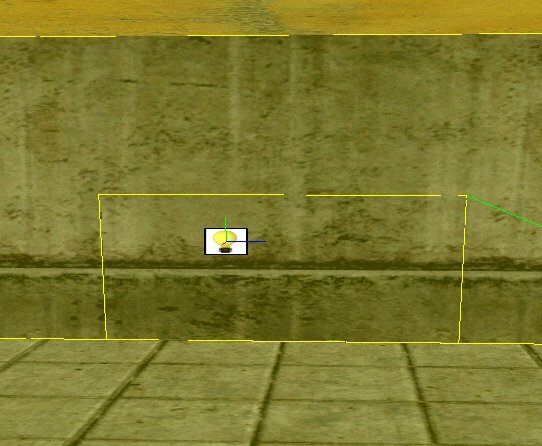 Place the marker (green x thingy) by well...pressing x somewhere in your cube 64 units off the ground. 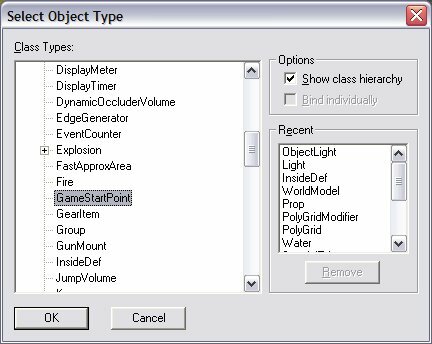 Right click select add object and choose game start point. Face the right way when spawning! 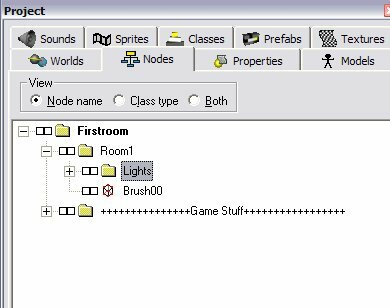 Add your World Properties and Light. Find an out of the way corner inside your first room close to the ceiling. 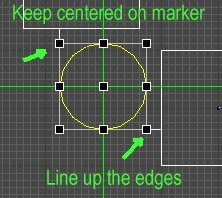 Place the marker there with x. Right click and add object. Select World properties. You don't have to change any of the properties here for the time being. This object MUST be somewhere in your map. If you are falling through or having other problems, make sure you have a world properties in somewhere. It doesn't matter where, but I like to place mine in a corner, above 128 units. Shedding some light on the situation. Every dark tunnel needs a light at the end. 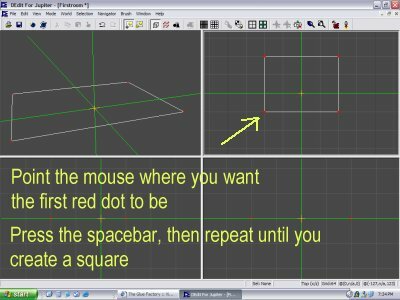 So put your mouse smack dab in the middle of your cube (tickles doesn't it? 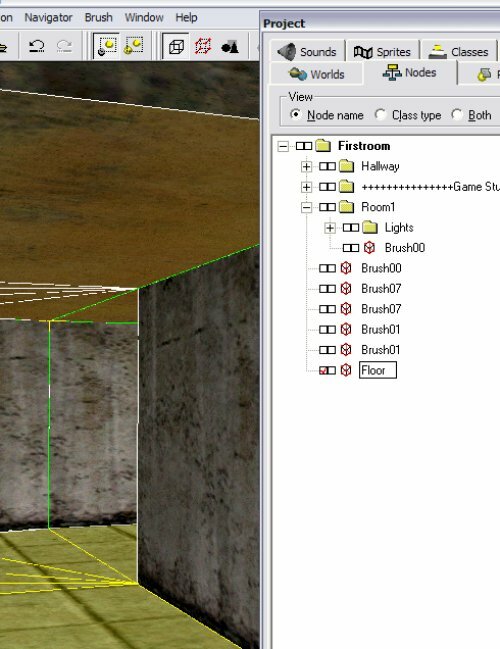 ), press x to place the marker there and right click and choose add object and then select LIGHT. 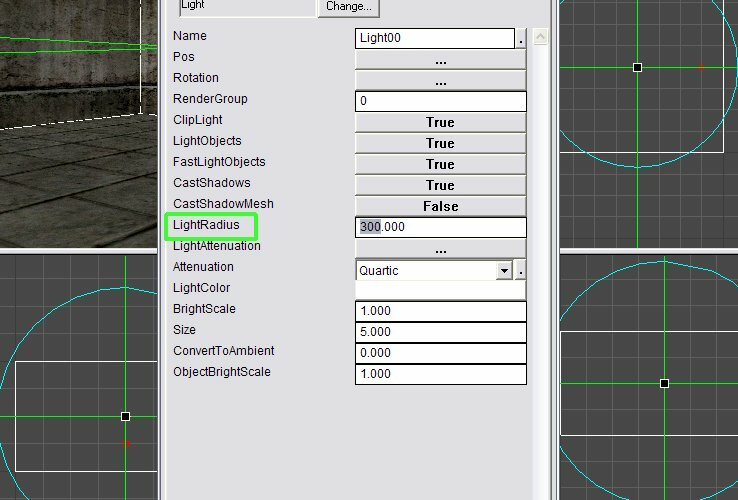 With the light object still selected, bring up your project window, click properties, and change the light radius to 500. Typically the light starts to drop off before the edge of the walls, so you usually have to make it bigger. One more thing, Select your cube, and click properties tab. 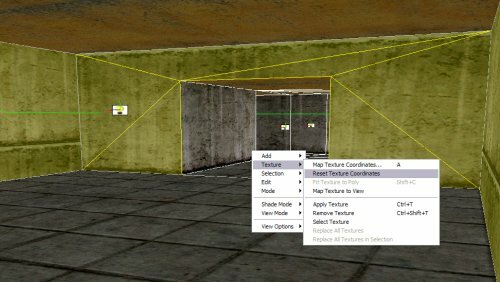 Choose Lightmap for lighting. This will make the light light your room in a realistic fashion. Gouroud lighting is best for terrain and round objects like pipes or barrels. 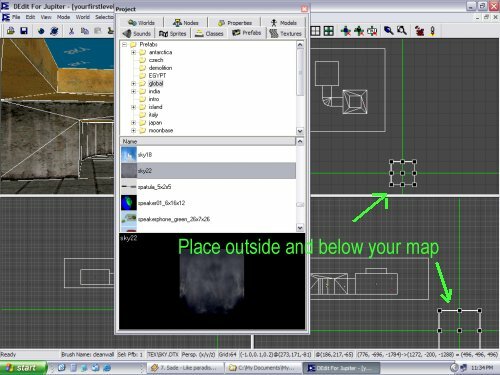 Processing and running your map. 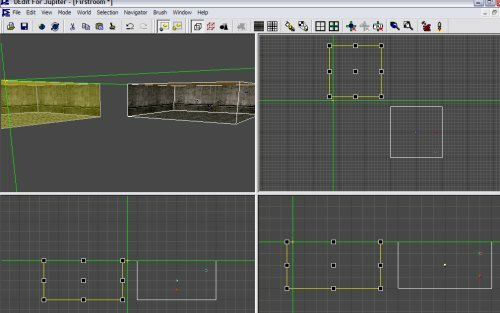 This tutorial won't cover everything on processing and running the map. There are multiple threads at www.nolfgirl.com in the forums if you don't understand it or get stuck. Be sure to read Coty's setting up DEdit tutorial on my main tutorial page. Most of my maps take no more than 3 minutes. This map should take maybe 2 seconds depending on your system specs. Once it's finished processing, simply click the rocket icon in the top right to run the level right from DEdit. Louis, this could be the beginning of a beautiful relationship! Excited aren't you? Now go ye therefore into all the world and create cool NOLF2, CJ and TRON Levels! Add a second room with a connecting hallway! First thing we want to do is take the room from the last tutorial and organize stuff so that we can find it once our level becomes complex. Bring up the project window and click the 'nodes' tab. rename it (f2) to something like room1. Containers keep your level organized in the nodes view. 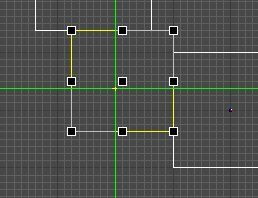 Adding a bunch of plus signs makes finding key nodes quickly. When you start to have hundreds of items in your nodes view, finding the game stuff node can save you lots of time. 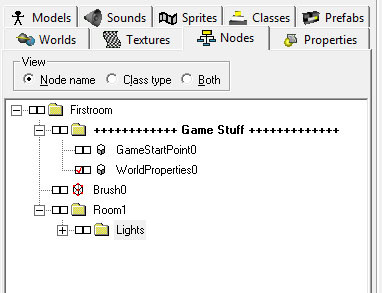 I put stuff like 'gamestartpoint' and doomsday prefabs and worldproperties in the gamestuff folder. You can name it anything you want. Now Right click on the game stuff folder and choose move tagged nodes here. 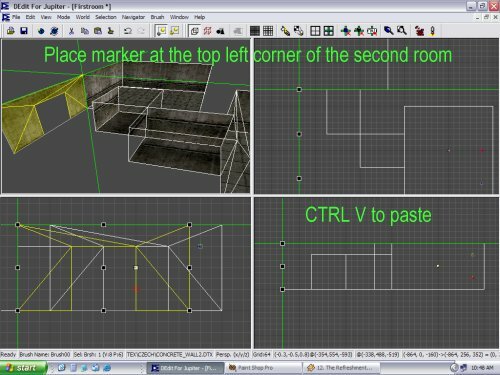 Since we are lazy, we are going to select the first room, hit ctrl+c to copy it, line up the marker, and ctrl+V to paste it. Paste it in an L shape. This is better since I will show you how to use occluders later. 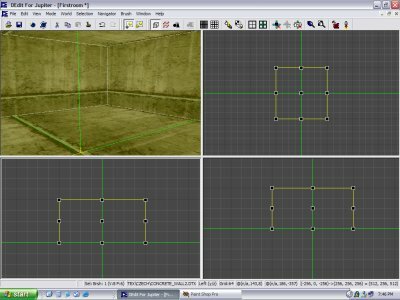 Occluders will block the computer from drawing the next room without you in it! It's so easy, your grandma could do it. Now Create a new cube that will eventually be one of our hallways. 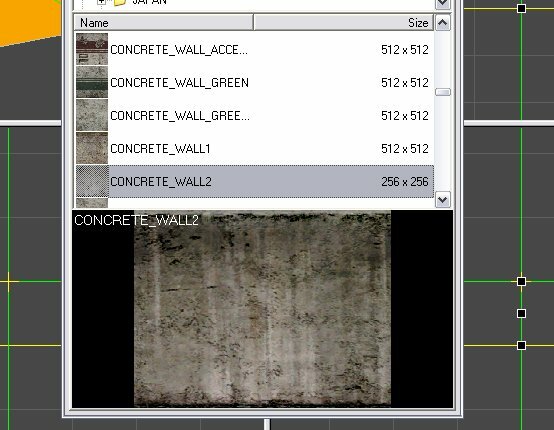 If you selected the texture off the wall, it should have created a cube with our wall texture. Make the cube 256 long by 128 tall and 128 wide. Now since nothing has changed (we are still lazy) we want to copy and paste our hallway cube. Paste it right next to the other hallway. 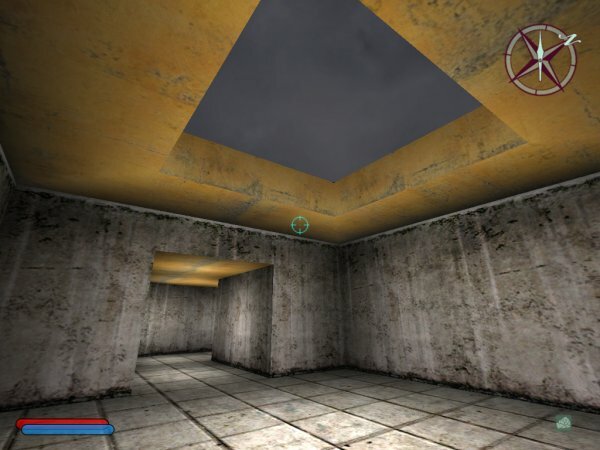 Now with the second hallway cube selected, hold CTRL and tap the right arrow so it rotates the cube 90 degrees. This is what it should look like now in the top view. Now we need to eradicate the end caps off of the hallways. 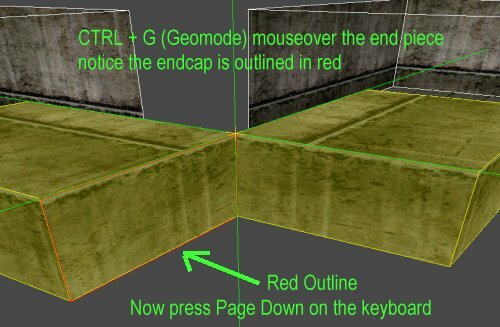 Go into Geomode (CTRL + G) mouse over the end caps and hit page down. Do this to all 4 end caps. Delete the ones inside the rooms. 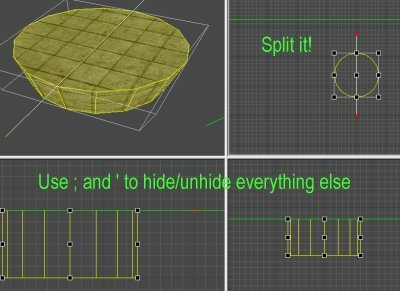 Hit F to flip the texture to the inside. Now we basically have two hallways ready! Now to create the opening in our big rooms to the hallways. With the big room1 selected and the hallway nearest it selected you can see where you need to cut the hole. Well we aren't really going to cut a hole. 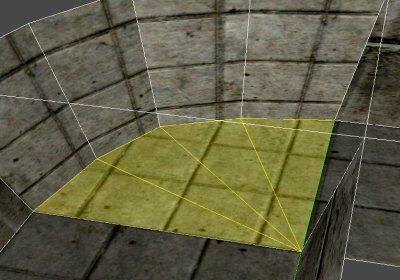 Instead, we will completely rebuild the wall cleanly out of triangles. This is better since if you rebuild it out of a few squares, you create T junctions where the processor will break them up in game creating sparklies in your level. Build in Geomode so the brush has NO THICKNESS! Here is what the section looks like in the 3d view. 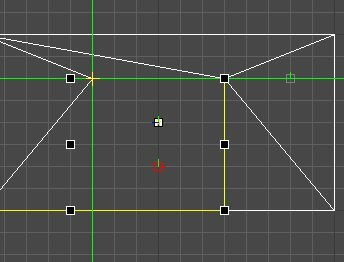 Continue to build the sections out of triangles. Clean building at its finest. 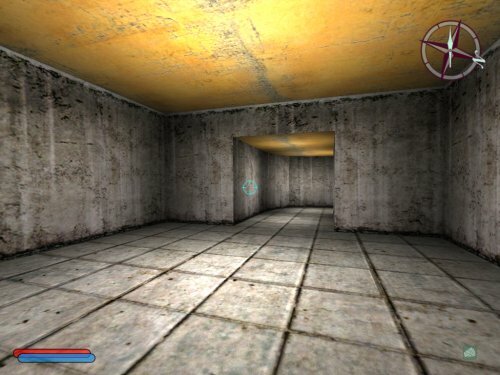 Wait a minute... That hallway looks wrong. G'head and stretch it out (brush mode CTRL + to 192 units 2. Do this to both hallway sections. Oops, now we need to fix the wall section. 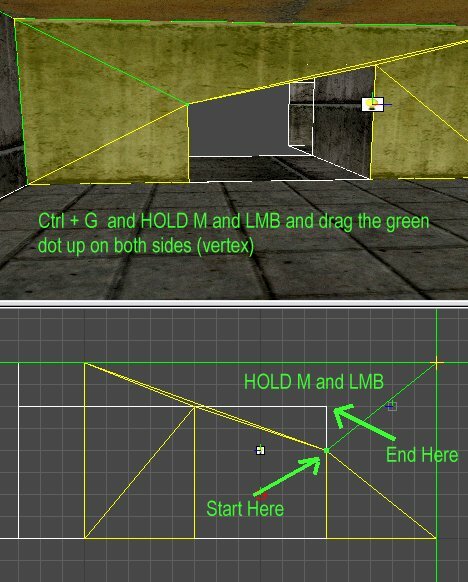 Go into geomode, hold M over the vertices and LMB (drag) the vertices up to meet with the new hallway height. Now that room 1 has a wall section remove the wall in room2 that covers the hallway (page down in geomode) then select your new wall section. One thing I should mention is that I do a lot of joining and un-joining. Hit shift + J to join your triangle wall together. 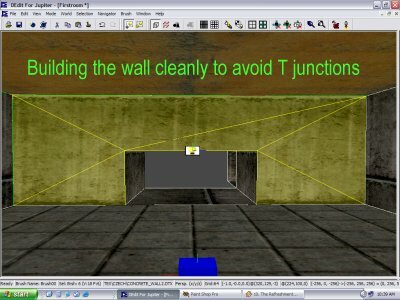 Place the marker as in the picture and paste your wall section, notice that it is not the right angle. Hold CTRL and tap right arrow in the top view to place it. Now its time to add a curved section for our two hallways to meet. 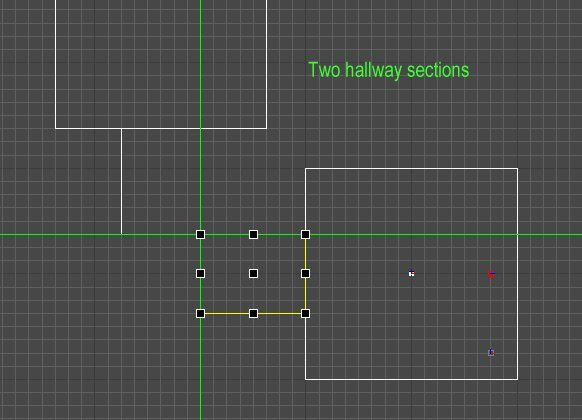 Select the two hallway sections, and place the marker at the corner of where they meet. 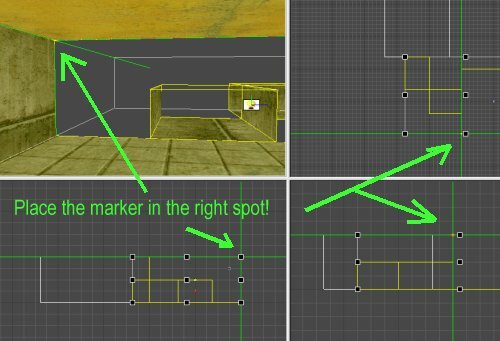 Get the marker in the right spot in two views. 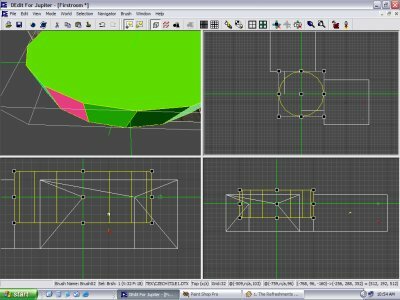 Click Brush at the top, select Add Primitive, Cylinder. This screen will pop up. We want our curve to have 4 angled sections, since it's only going to be 1/4 of the cylinder, we need 16 sides. 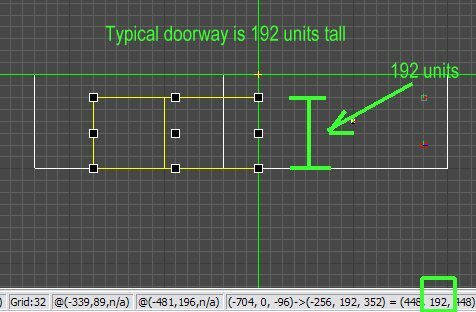 Height should be the same as our hallway 192. Radius should be an approximation. We are going to have to change it manually later so it's not exact. Ground control to Major Tom; We have a Cylinder! We are really only going to use 4 sides of this cylinder so we need to resize it and then cut it down. Notice in the above pic, the cylinder does not match our hallway, let's move it down. Ok, that's better. The cylinder has been resized and moved down. Notice the outer wall of the hallway is what we are matching up. Line up the cylinder with the hallway. See arrows. Since we are only using a small section of the cylinder, its high time we got rid of the junk! Select the cylinder, hit ; to hide everything else. Hit ' to bring it back. Now in the top view draw a line across the middle (exact) using spacebar. Hit S to split the cylinder in two. After hitting S you will see the cylinder is split. Select the right chunk and hit delete. Now lets cut it in half again. This time from left to right. Now we need to remove the 4 faces that we don't need. 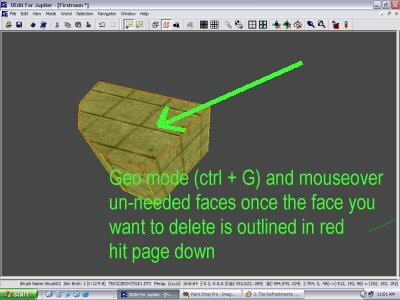 Moving around the pie section, in Geo-mode, mouse-over the faces you don't want and use page down to remove them. Now go back into brush mode (ctrl + and hit F to flip the texture to the inside. 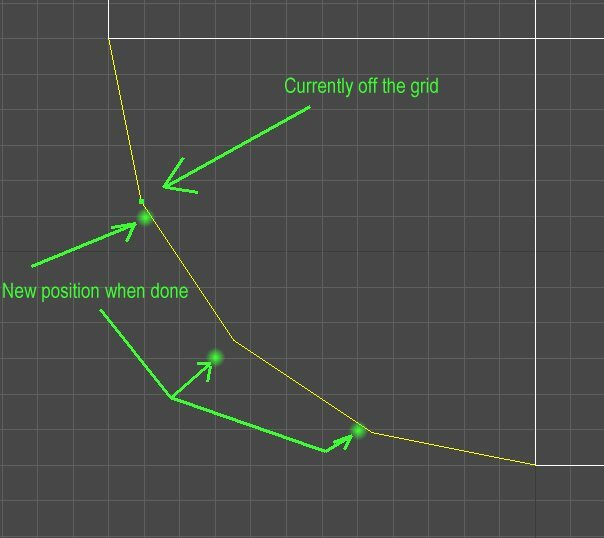 Move the new curved wall section to the grid. When you create a cylinder, DEdit creates a cylinder that has the vertices off the grid. 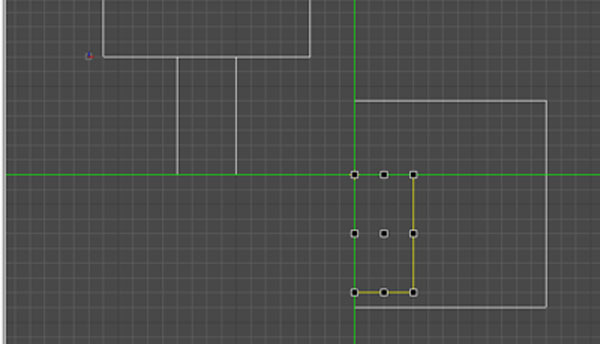 We must go in and manually move the vertices to the grid. 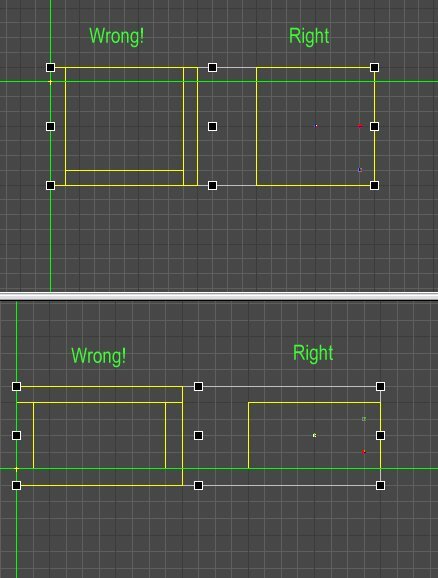 Select the chunk of wall, go into geomode, hold M on the keyboard and LMB and move the vertices to the nearest grid junction. 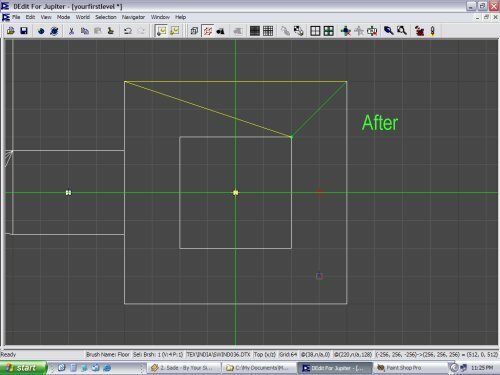 Once you've moved the vertices to the grid, lets create a floor for our curved section. Building it out of triangles will ensure proper lighting and no sparklies. Once you've created the floor, hit shift + J to join the floor together. Instant floor (well maybe not instant). Copy and paste it to the roof. Line the marker up with the roof. 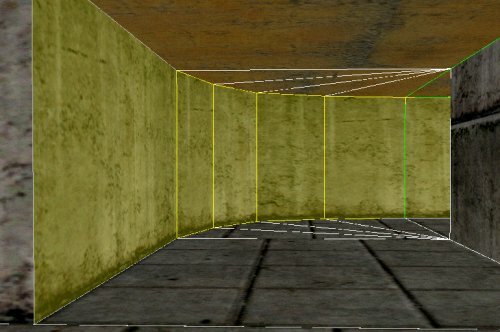 Hit F to flip the roof texture to the inside of the hallway. 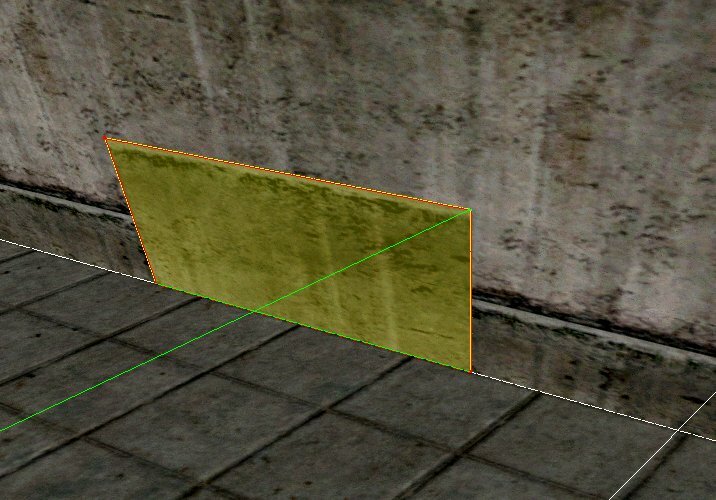 Now that we have our corner section, notice that the wall texture may be off. 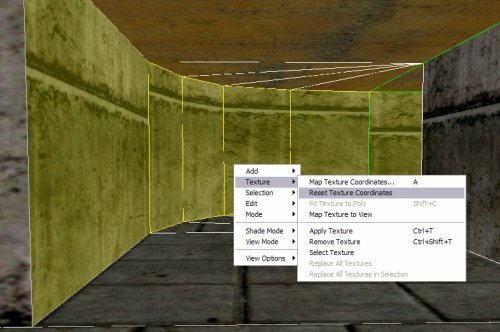 un-join the hallway sections (select them and hit ctrl +j) now select all the left side walls, right click choose texture and reset texture coordinates. Ah yes, it looks way better now. Time to organize. 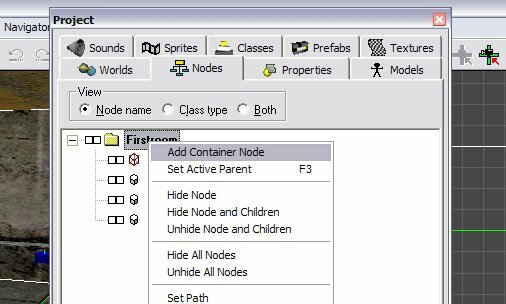 Bring up the project window (ctrl + spacebar) and move the nodes into containers. 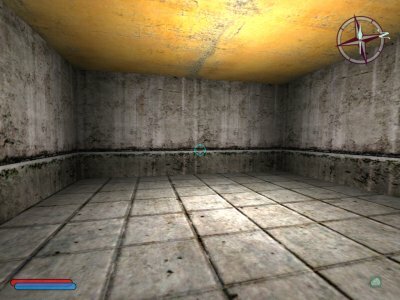 You may have some cleanup work with textures to do. 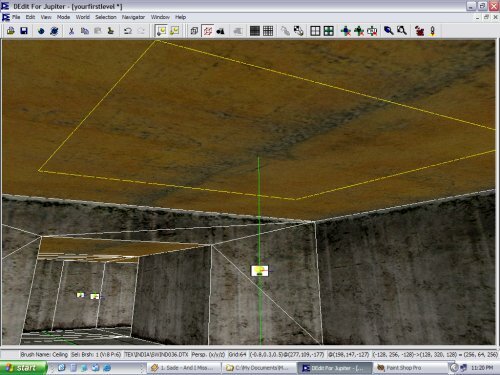 I went back and lined up the floor textures as well as fixed the ceiling texture in the hallway to match the big rooms. 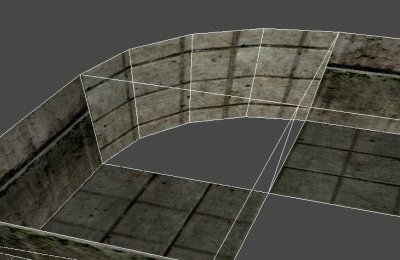 I find that joining walls together and resetting the texture coordinates works best. I added three lights to the hallway and one big one in the second room. Change the radius to 150 or so. Select the entire level by going into the nodes view and clicking your main container. Everything becomes selected. 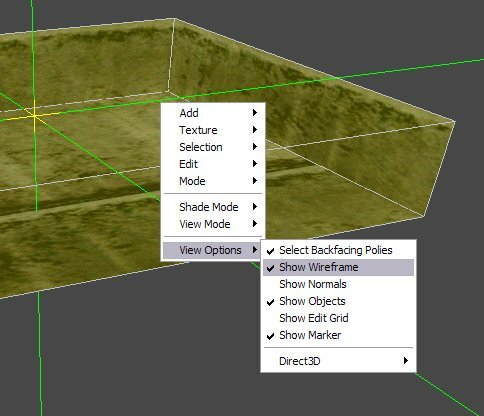 Now click the properties tab, set the lighting to lightmap, even if it is already. 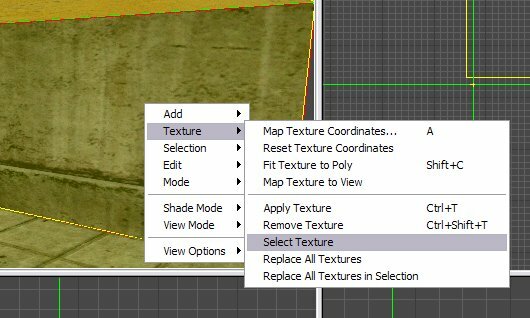 This will change any gouroud lighted brushes to lightmap. Say goodbye to your social life! Now you are hooked into creating whatever your mind can imagine. Who says games are just violent and destructive? Someone's got to CREATE them! DON'T LET PARENTS TEACHERS OR POLITICIANS BAD MOUTH VIDEOGAMES! 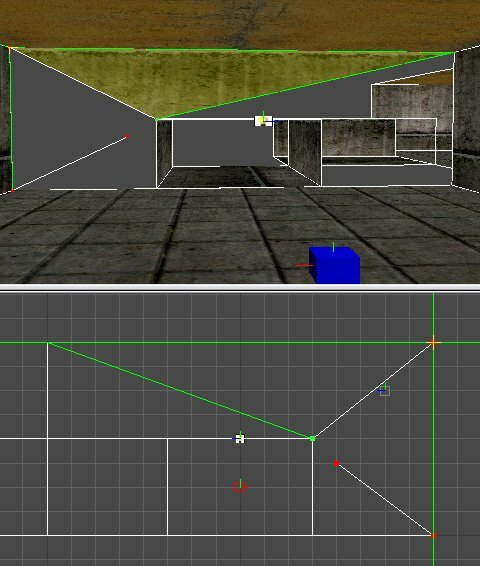 Level design will teach you so many things! Architecture: You will never look at buildings the same way! Art: You create it with your hands and mind. Light and color: The use of light and color can make the most mundane level spring to life. Planning: Fail to plan, plan to fail. Persistence and follow through. If you start it, finish it. Time management: Don't spend 100 hours on a detail that few will notice. Adding a Sky to your first room. 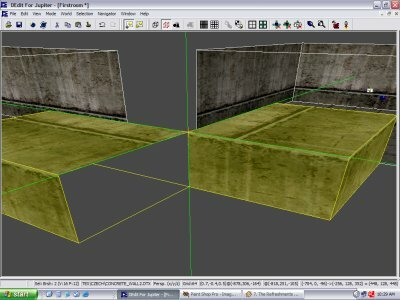 Add the false detail brush and box containing your world. Check it, we 'bout to be about this beoctch. 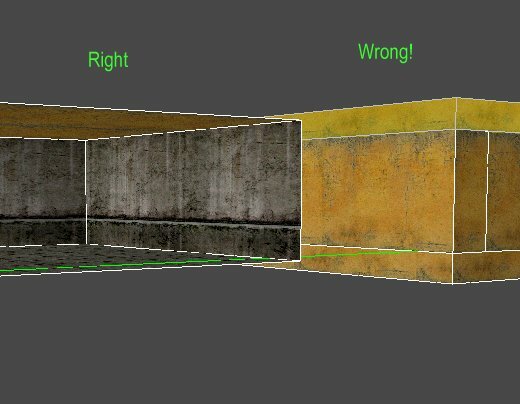 Alrighty, so you need a false detail brush in your level. According to the docs, it should be a concave brush containing your level. 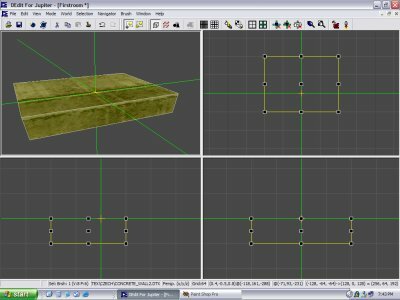 Well- make a box, drag it out so it contains your level, flip the texture to the inside and put the blocker texture on it. 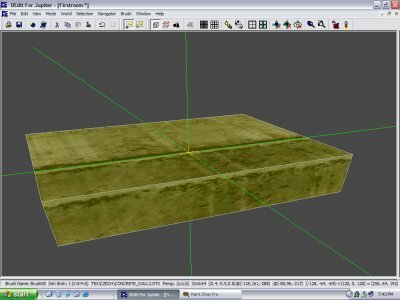 The blocker texture is in the TEX root folder. Bring up the project window, click the properties tab, change Type to BLOCKER and Lighting to flat. Change the Detail to False. The roof, the roof, the roof needs a hole. Start by creating a cube 256x256x64. Place it flush with your ceiling in the first room. CTRL + G , mouse over, Page down. CTRL + B, hit F to flip the texture to the inside. Our stupid ceiling needs a stupid hole now. Since there is a brush there already, no sense in deleting it. 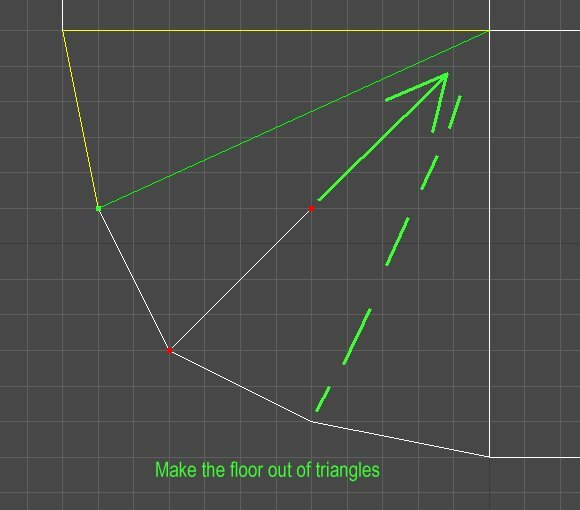 Make your ceiling into one of the triangles we need for the new holy ceiling. 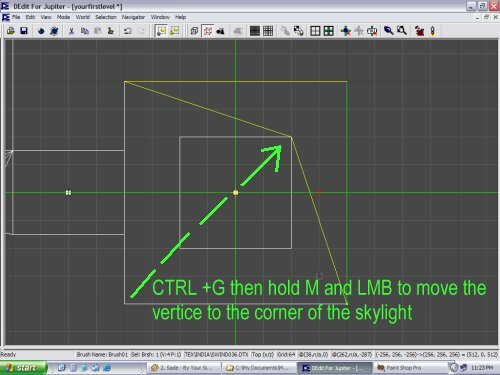 CTRL + G, hold M and LMB (Left Mouse Button) drag the corner to the edge of the skylight hole. Concave brushes are not allowed. Picture a spoon. There is no spoon. One of the triangles is now complete. Some times you just got to say "damn that's cool!" Notice the vertices all touch. 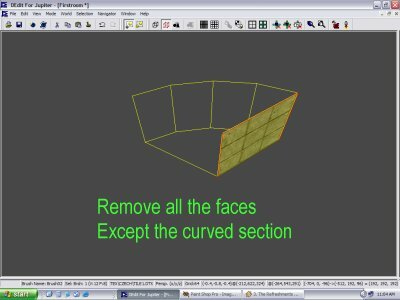 Select just the side 4 faces and rejoin them (shift +J) leaving the top polygon un-joined. 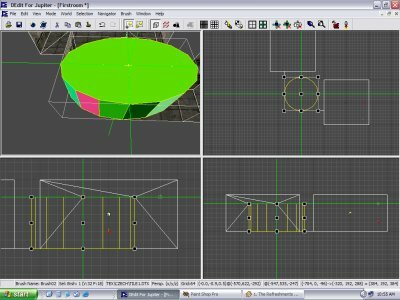 Select ONLY the top polygon, bring up your project window and in the TEX root folder select the SKY texture. HIT CTRL + T to paint it SKY. 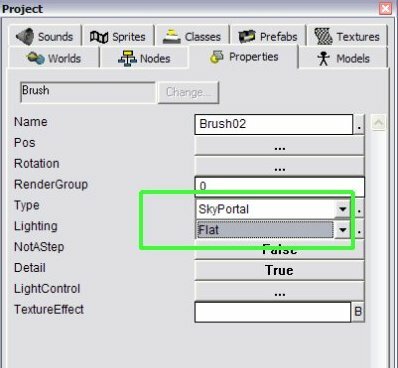 Now select properties of this brush and change the type to Skyportal and the lighting to flat. 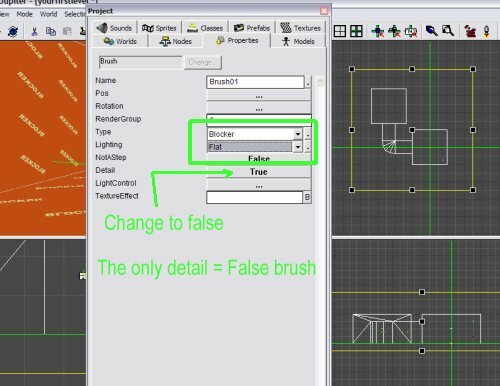 Place the marker (x) outside and below your blocker false detail containing box. Click on the prefabs tab in the project window. Choose the global folder and add one of the various skies. Save and process your file. 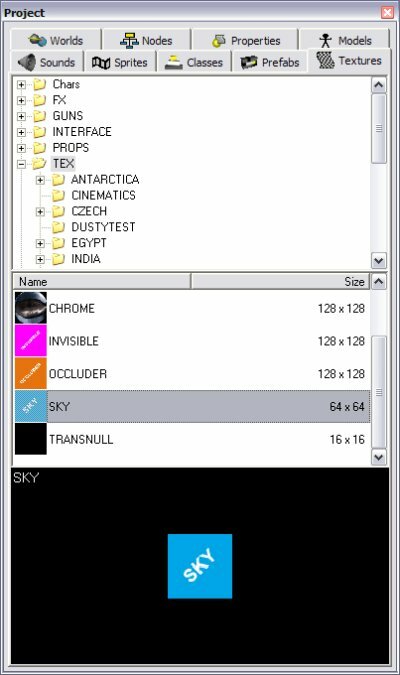 Now wherever you place a sky texture (with skyportal in the properties) in your level, it will show your nice sky.